Some of the ‘most prominent issues in healthcare’ and ‘stories of hope and recovery’ were all on the agenda at the Health and Wellbeing Summit held by the Association of Medical Insurers and Intermediaries (AMII). 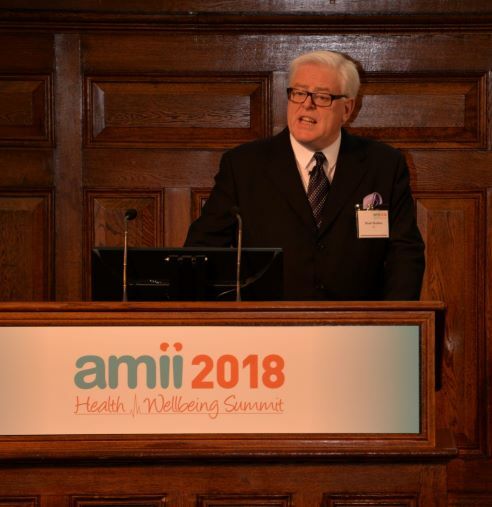 Opening the Summit, AMII Chairman Stuart Scullion talked of ‘continuous change and advances in healthcare’ before introducing the themes of the 2018 flagship event: Mental health, Artificial Intelligence, and improving quality in the industry. Addressing the delegates about how AI is shaping the healthcare sector, Dr Umang Patel, Partnerships and Clinical Director at Babylon Health, said: “We believe it’s possible to make healthcare affordable and accessible and put it into the hands of everyone on earth. “We’re creating an artificially intelligent doctor built to mimic and augment a doctor’s training with the knowledge equivalent of 10+ years of medical training and decades of practical experience. “To build an AI doctor we first need to capture human knowledge on modern medicine and encode it for machines. The AI doctor needs to understand billions of statements and continuously learn from new statements, for example. “We also need to look at perception, so an AI doctor can understand the unique ways humans’ express symptoms, comprehend different language we use and read facial expressions in the way a real doctor would. “Developing these areas further we are increasingly able to solve a range of healthcare challenges using AI and we expect to build this even further in the next six to 12 months. Matt James, who established the Private Healthcare Information Network (PHIN) in 2012, provided an update on the network’s progress in bringing transparency to the sector and discussed the joint project with NHS Digital. Jonny said: “We want to tell a story today which has some really key messages around mental health and suicide, and we hope by sharing our story we can make a difference. “Although people are starting to raise awareness of issues around mental health, there’s still a massive stigma and a huge difference in how mental and physical health are treated. Neil was described by Jonny as one of the “silent heroes” – one of many who go unrecognised but have saved a life by helping someone to overcome a suicide attempt. Neil said “This Can Happen was a chance for us to look positively at the spectrum of workplace mental health and it was the biggest conversation we’ve had around this area of mental health that we’ve had so far. “We know that in the near future legislation will play a role in how companies address mental health, but we also want employers to understand the business case as well as how it is the right this thing to do for staff. Companies should want to be at the forefront of this conversation, leading the way. AMII’s Stuart Scullion concluded the conference by thanking Jonny and Neil for sharing their ‘inspiring, interesting and compassionate story’.